In a few days, another actress of Nepali film industry is getting married. 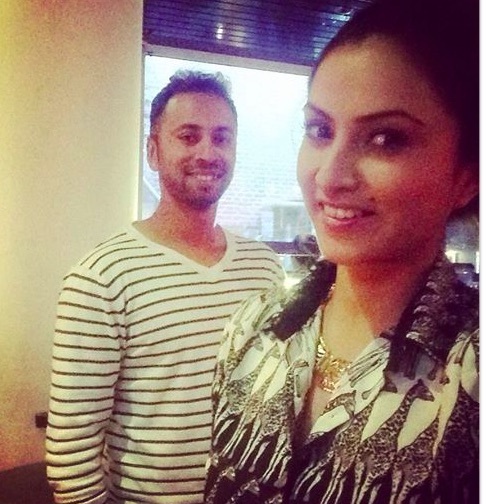 Nisha Adhikari is going to marry her long-time sweetheart, Sharad Veshwakar. I had talked about their affair (in 2014) and ‘rumoured’ breakup (in 2015) but, the marriage came so sudden that, there was no time of speculation. Last week, there were reports that she was going to get married soon. That was an unexpected news because, they weren’t seen together for more than a year. Now, the invitation cards are already distributed and the family members of the two are in full-fledge preparation of the marriage to be held this Friday. Read the full biography of Nisha Adhikari here. Education – ‘A’ Level in 2006. After that, she stopped her formal education but she is trained in acting from the New York Film Academy. Nisha was selected to participate in Miss Nepal 2008. But, the event was cancelled at the last minute. Nisha likes traveling, reading books, and is very keen in adventure sports. Sharad Vesawakar is 6 October 1988. He is two years and two days younger than Nisha Adhikari. Sharad is a right-handed middle-order batsman and a right-arm off break bowler. He debuted for Nepal against UAE in March 2004. He is currently the no. 80 ranked T20I batsman in the world, after achieving the 250 rating benchmark on 17 July 2015. Sharad Vesawkar was born and raised in UAE, as the second son of Dilip Vesawkar, an engineer, and his wife Himali. Sharad and his brother, Mahendra, learnt to play cricket in their childhood in UAE. His family returned to Nepal in 1995 after his father retired. Congratulation to Nisha Adhikari and Sharad Vesawakar for the marriage and I wish them a very happy married life. This entry was posted in News and tagged marriage, Nisha Adhikari, Sharad Vesawkar. Bookmark the permalink. ← Binita Baral graduates in the USA, will she return back to the film industry?